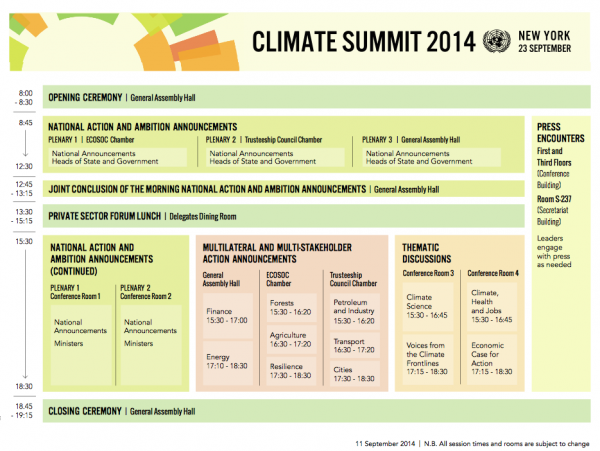 Years ago, countries of the world committed to lock in a new international climate agreement at the 2015 U.N. Climate Change conference in Paris, informally called COP 21. It’s coming up fast, considering that for the past 50 years, scientists have been expressing their sense of an impending showdown between the people of earth and its climate. (See “The Unchained Goddess” video following this article.) Ordinary people as well as almost all scientists and nations have come to anticipate climate change, and today’s UN Climate Summit, with the other events of Climate Week, should prime the world to prepare for it. But right now, the world is only on track to make less than half the carbon pollution reductions we need by 2020 to prevent massive global changes. We do have the technologies and policies available to turn the corner on the possible Sixth Extinction—but lack of political will and intercountry squabbles could prevent us from achieving achieving this goal and moving forward into an era of low or zero-carbon economic growth. For these reasons, U.N. Secretary-General Ban Ki-moon has convened a UN Climate Summit for world leaders in New York City today. As well as bringing the world’s political leaders to the table, the meeting will draw together captains of industry, world and regional financial institutions, policy regulators, and ordinary citizens. Ban has invited them to share and cross-fertilize ideas for reducing emissions and reaching an effective global climate agreement in Paris next December. You can follow the events from the UN Climate Summit live all day at the UN Web TV Channel and probably other venues as well. The UN Climate Change Newsroom on the web has dozens of reports on all the issues. Networks and independents will provide coverage as well. Important Media will be reporting from UN Headquarters and the streets of New York and from other correspondents about the People’s Climate March, UN Summit, and Climate Week programming and events. Follow the climate stories throughout the week here on Planetsave and on our fellow site, Cleantechnica. You can also access our past climate coverage at these links: Planetsave archives and Cleantechnica archives.